How much freshwater is available to support the multiple demands for water for domestic supplies, industrial development, agricultural irrigation and hydropower generation while satisfying the needs for ecosystem maintenance? How does land use/cover change resulting from human- environmental interactions affect the watershed hydrologic processes over space and time? How can hydrologic models and spatial technologies be incorporated in planning processes to support watershed management and ecosystem protection? Dr. Chansheng He is a University Distinguished Faculty Scholar and professor in the Department of Geography at Western Michigan University. He has published over 100 articles and proceedings papers in leading national and international journals such as Journal of Hydrology, Environmental Modeling and Software, Geographical Analysis, Landscape and Urban Planning, Journal of The American Water Resources Association, Journal of Hydrologic Engineering, Journal of Water Resources Planning and Management, Control Engineering Practice, and Journal of Environmental Sciences. A GIS-nonpoint source pollution modeling interface (ArcView Nonpoint Source Modeling or AVNPSM) he developed has been used in 12 countries. The Distributed Large Basin Runoff Model, a physically-based, distributed hydrological simulation model developed in collaboration with the NOAA Great Lakes Environmental Research Laboratory has been successfully applied to over 40 of North America's Great Lakes watersheds, and watersheds in Northwest China and other countries. In the 1990s, he proposed an analytical framework for analysis of agricultural irrigation, food production and ecosystem protection and applied it to the U.S. agricultural irrigation. In 2008, he and his colleagues first proposed the Hydrological Resource Shed concept in the international hydrological community. This concept and related computation techniques could be a very useful tool for hydrological research and water quality management at different scales. His research projects focus on refinement of the DLBRM to support water resources research and decision making in the Great Lakes Basin, and analysis of hydrologic impacts of climate change and human activities in Northern China in collaboration with Lanzhou University and the Chinese Academy of Sciences. Dr. He serves as a reviewer for research proposals for U.S. EPA, USDA, NSF, NASA, NOAA, USGS, and other national and international institutions such as The State Natural Science Award and National Office for Science and Technology Awards of China, and Australian and Belgium institutions. He reviews manuscripts for over 40 national and international journals. He serves on the editorial boards of Science China Earth Sciences , Journal of Reosources and Ecology, and Chinese Geographical Science (English edition), etc. 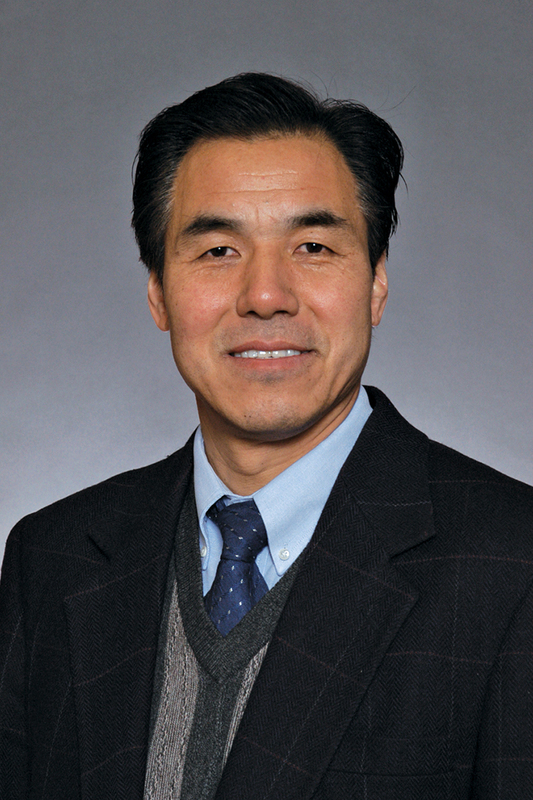 As a Fulbright Specialist, he is also an Adjunct Professor of Lanzhou University, Shanghai Jiao Tong University, and The Chinese Academy of Sciences Institute of Geographic Sciences and Natural Resources Research. Development and refinement of a distributed large basin runoff model (DLBRM) to support water resources research and decision making in the Great Lakes Basin, in collaboration with Thomas Croley of the NOAA Great Lakes Environmental Research Laboratory. Analysis of hydrological and ecological impacts of land use activities in the Yellow River basin, and understanding of water movement among glacial, oasis, and desert in arid Nortthwest China, in collaboration with Lanzhou University and The Chinese Academy of Sciences. PI, “Impacts of land use/cover change on land surface water-energy processes in the agricultural-pastoral transitional zone, Northwest China”, NSF of China, 1/1/2016 – 12/31/2020. PI, Observations and experiments on heterogeneity of soil hydraulic properties and its effects on hydrological processes in the Upper Reaches of the Heihe Watershed, Northwest China, NSF of China, 1/1/2012 – 12/31/2015. Principal expert, Key issues in ecological-hydrological-socio-economical system of Greaterr Dunhuang Ecosystem, 2013 Key Research Support Program of Central Government Higher Education Basic Research Founding, Lanzhou University，1/1/2013-12/31/2014 . Collaborator, Impacts of Climate Change on the Hydrological Process of Water Cycle in Arid Northwest China (2010CB951002), The Ministry of Science and Technology, 06//1/2010-05/31/2015. He, C. 2016. Quantifying Drivers of the Sediment Load Reduction in the Yellow River Basin. National Science Review, 3(2): 155-156, doi: 10.1093/nsr/nww014 (SCI Impact Factor: 8.0). Zhang, Baoqing and Chansheng He. 2016. A modified water demand estimation method for drought identification over arid and semiarid regions. Agricultural and Forest Meteorology 230-231:58-66 (SCI), http://dx.doi.org/10.1016/j.agrformet.2015.11.015. ZHANG, Baoqing, Chansheng He, Morey Burnham, and Lanhui Zhang. 2016. Evaluating the coupling effects of climate aridity and vegetation restoration on soil erosion over the Loess Plateau in China. Science of the Total Environment, 539:436-449 (SCI), http://dx.doi.org/10.1016/j.scitotenv.2015.08.132. Ding, Yongjian, Shiqiang Zhang, Fengjing Liu, Daqing Yang, Chansheng He, and Svetlana Stuefer. 2016. Hydrometeorological Observation and Study in High Altitude Area. Advances in Meteorology, Doi:10.1155/2016/1372464. (Editorial). For the complete list of grants, publications and projects, please download the CV.